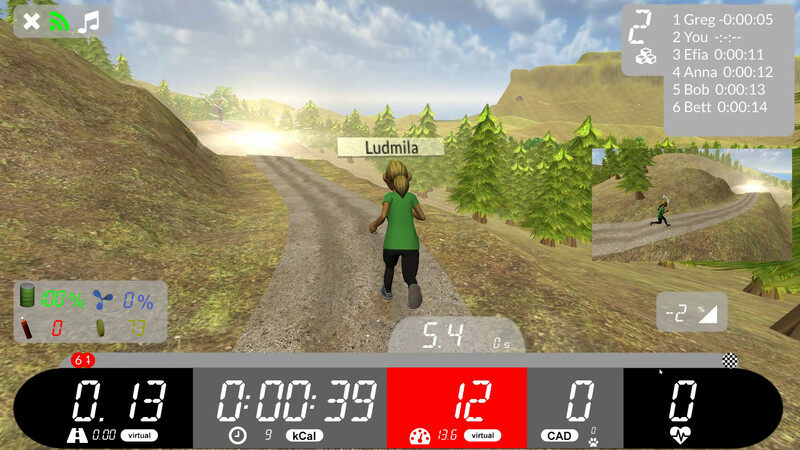 How to make virtual races with your friends? Multiplayer mode allows you to play with your family and friends anywhere you are ! You can also play with other Arcade Fitness users all over the world. How to access Multiplayer mode? 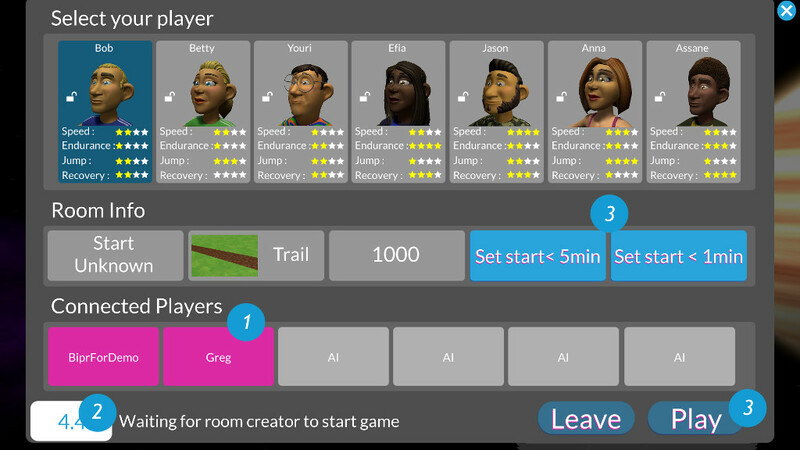 In order to access Multiplayer mode, you first need to complete a level in training mode. 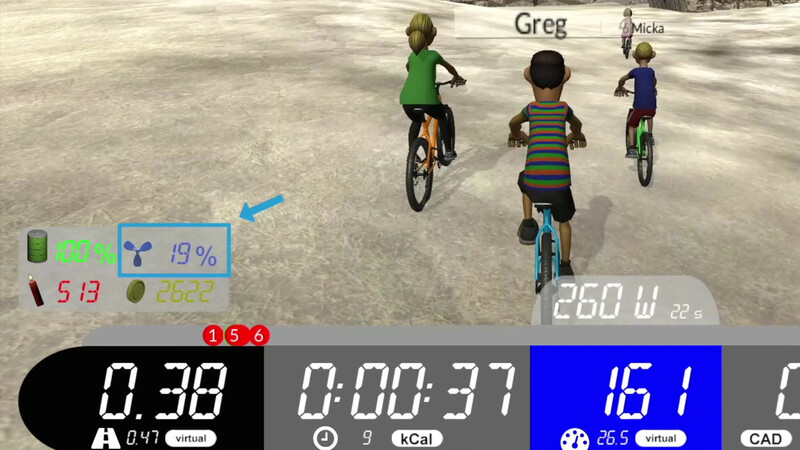 Then, simply click on 'Play' button of Arcade Fitness Main Menu. Then the app will search for your device or sensor, that's why you need to start running or pedalling. Once the device or sensor is found you will be asked to create a new room if no rooms are currently open, otherwise you will have the option to joint an existing room or create a new one. Once the room is created or joined and the eventual workout for training is choosen, you enter the waiting room. Other connected players. The free places are filled up with AI bots on the right side (in grey). Sensor indicator. Get the running speed or cycling power while in the waiting room. Click here to start the game. Only room reator can start the game, with a count down for verybody (upper buttons) or directly (lower button). You need to wait for other players in this waiting room. How to find other players? The best way to find and coordonates with other players is to use our Discord 'looking-foe-players' textual chat room. Join us by click the Discord icon in the app's Main Menu. Is it possible to have a voice chat while playing? Discord offers both voice and textual chat rooms. Want to have fun but winning is important to you ? Drop bombs to slow down the other players. This adds a strategic dimension because you need to be ahead of your opponents to attack them. In order to create a bomb, press the 'return' key on keyboard, click or touch the middle of the screen, or use a gamepad such as 8BitDo Zero gamepad. If you are using the MoonRun, you can do a squat. You can get bombs with virtual coins or buy them directly with real money (Android only today, click on the Shop button in Main Menu). When throwing a bomb to your opponents, you have to know that it will blast 2 seconds after you create it and then be effective for 2 seconds. After you have created a bomb, you cannot create another one for the next 10 seconds. Bombs can be avoided after explosion buy jumping over it or going under it, depending on the case where it has been created. Is there a Strava club?